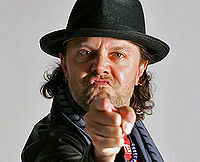 Lars Ulrich says "Music pirates are NAUGHTY, NAUGHTY CHILDREN." The following is a public service announcement from the Recording Industry Association of AmericaTM. Hey, kids! Imagine that your friend asked you if he could have a copy of a song you're listening to. Well, if you listen to your teachers and parents, who are actively involved in your life and able to give accurate and relevant insight, you might think that sharing is okay, so you might copy it onto a CD and give it to him. Harmless and beneficial, right? Wrong. You see, kids, file sharing is a trend that has appeared among many of America's fine youth, and many people consider it to be okay. However, I'm here from our friends at the RIAA™, a faceless collection of suits who will never know you nor care about you, to tell you the truth: that file sharing is evil. Here's why. As you can plainly see, boys and girls, file sharing is undeniably evil. Yes, evil. Few crimes are as great, or as terrible, or as destructive, as the act of giving people copies of what you have, for free. You see, kids, there was once a great evil empire that was at war with good old-fashioned American family values. This evil empire wished to completely eradicate fairness and justice, enslaving innocent people such as yourselves and turning them into mindless drones working for the New Order. Do you know who these people were? The act of file sharing involves giving people copies of files. Files are endlessly copyable, and the Internet makes it easy to swap files with others. Under file sharing, everyone has all the files they need. Do you know what that makes file sharing? The proper conclusion, boys and girls, is that file sharing is evil. When two consenting people share files between each other in the privacy of their own homes, they are violating all sorts of laws and committing the worst possible kind of crime: Theft. Each song that is shared on the Internet directly translates into hundreds of thousands of lost sales for the poor, innocent record label. And not just online, either! Theft is rampant in each and every medium of our society. Theft happens when someone hears a song on the radio. Theft happens when you lend a CD to a friend. Theft happens when you don't buy our newest overpriced CDs the moment they are released. Every single person, even seemingly innocent people like your mother, is committing crimes of great magnitude daily against the RIAATM, against musicians world over, and against America itself. See, the image says it all- dirty, thieving pirate scum. Trust me, boys and girls, you don't want to be dirty, thieving pirate scum. You're stealing from the artist. Some of you might think it a little odd that a millionaire musician would attack a child for listening to his music, but away from Fantasy Land and in the Real World, that is how it is. Every time you download a song on the Internet, you commit Grand Theft Audio (see what we did there?) against an innocent artist. And the artist will sue, and your family will be forced into bankruptcy, and you'll be out on the streets eating shoes to survive, and the artist will take your family's meager worth and put it towards his Private Space Shuttle fund. So just don't do it, okay? We'll get our money from you either way, of course, but lawsuits mean our lawyers actually have to do something, and they always complain when that happens. You're stealing from the record company. Not just the artist is affected when you share music. The record companies make all the magic happen; they're the ones who bring you the cultural treasures that we all know and love. Every song that is downloaded over the Internet translates into not only a lost sale, but potentially billions of lost sales. Because digital music is endlessly copyable, anyone who downloads a song could potentially give copies of that song to everyone in the world, thereby directly depriving us of badly needed revenue. Because we are too lazy to decide whether this is true, we simply assume it has happened and sue every person in the world for $150,000 times the number of songs that exist. Not even that will, however, be enough to cover the lost sales from file sharing. We, the record labels, are vital to American culture. You see, boys and girls, we can't compete with free, so we'll have to legislate our survival and create a propaganda campaign to denounce file sharing the Recording Industry Association of AmericaTM provides a unique and quality experience for music lovers that cannot be replicated or acquired elsewhere. Because the world's economy would collapse irreparably if people stopped buying music, it is fundamentally important that the music market continue. Therefore, it is in the best interest of society as a whole that we convince our glorious Senators to outlaw this draconian stranglehold on the music market known as file sharing. Some of you certainly look surprised, boys and girls. And I know what you're thinking. You're thinking "This man is correct! Those who share between each other are destroying the very fabric of our fine culture!" Well, fortunately for you, I have a few suggestions for "getting involved" in the sharing world, so that you, yes, YOU, can help stamp out this scourge once and for all. First of all, it is very very important for each of you to purchase the latest music right when it comes out. While we already work closely with advertising agencies, celebrities, and other publicly involved parties to shove our music down your throats as much as we can, but we figure a simple reminder couldn't hurt. Remember- if you hear it from someone besides us, it's stealing. Your money will be put to good use, we promise; proceeds from record sales go towards future ligitation against college students, grandmothers, dead people, preadolescent children, and other sharers. Most importantly, don't ever share, and make sure not to listen to music from unauthorized sources. Report any such sources to the police. This includes file sharing websites, friends giving away music, people making homemade videos and adding background music without permission, Girl Scouts singing "Happy Birthday" around the campfire, parents singing a copyrighted lullaby to their child, etc. It's the Right Thing to Do. And don't worry, it's okay to turn in your friends- after all, you don't want to be friends with commies, do you? Awareness can be fun too, boys and girls! Why not put on a short play like this one? Boy 1: Muahaha! 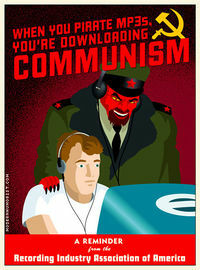 With this pirated music, we can bring the evil capitalist America to its knees! Boy 2: Yes, today will certainly be a glorious day for communism everywhere! Boys: (together) Oh no! It's Captain Copyright! Captain Copyright: Your pilfering days are over, Communist pirates! Captain Copyright: Your unauthorized music pales against my legal power! Taste justice, dogs! Boy 1: Arrrrgh! It burns! Boy 2: Make it stop! Make it stop! Captain Copyright: Hah! No mercy for sharers! You should have thought about this before you hit BitTorrent! Captain Copyright: Another victory in the fight against cultural sharing! Voiceover: Remember, kids, Captain Copyright only recognizes two sides: His friends, and his enemies. Which side do you want to be on? So listen up, everyone. The sooner you pitch in and aid the recording industry in its fight against sharing, the sooner dirty scoundrels like <insert name here> can be caught. This article is © 2011 the Recording Industry Association of America. Any unauthorized distribution or reproduction of this article, including viewing or memorizing any of its contents, is a violation of our demands that you buy our products. This page was last edited on 20 March 2017, at 03:43.